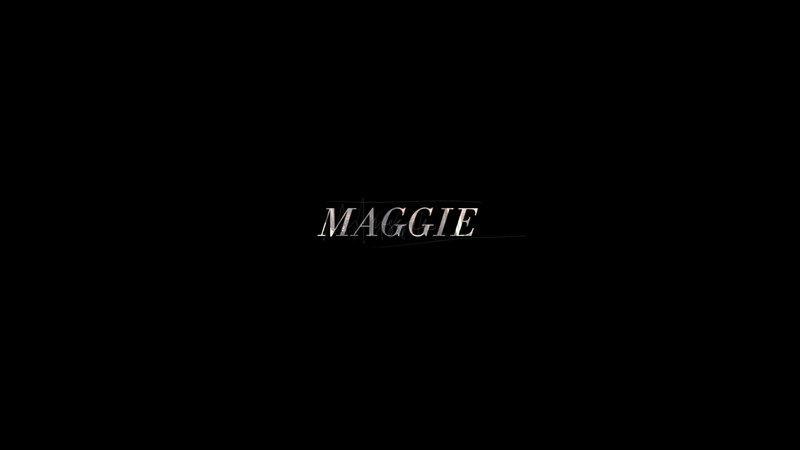 Conceptually Maggie actually isn’t a terrible idea and manages to distinguish itself with the plethora of zombie films that have permeated the cinema marketplace and only grew more popular with “The Walking Dead.” Still, for all the flaws with the screenplay and a WTF casting of Schwarzenegger, this might be worth a rental. Arnold Schwarzenegger vs. Zombies? Sign me up! Arnold Schwarzenegger attempting to do a personal drama set in a post-Apocalyptic world? Eh, something seems off. Don’t get me wrong, I like the guy but when he steps out of his element (i.e. off-the-wall action flicks), he tends to stumble. That being said, is he awful? Not really, but it is a unique casting choice that I found very distracting. On the plus, I first thought Maggie was just the next in a long line of zombie movies but thankfully it’s something far more personal and taking a viewpoint rarely seen. It’s a film less focused on blood and guts and the spread of a disease and instead we get a glimpse at the personal life of those family members whose loved ones have been infected and will then go into what is known as “The Turn” (i.e. become zombies). Best case scenario is their loved one ends their life; worst case is they are put into quarantine with others who are infected where upon they attack and eat one another. 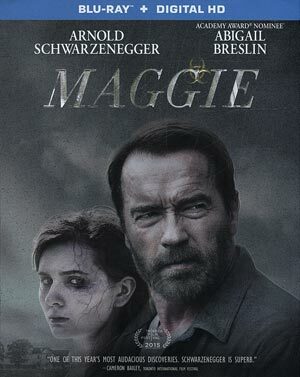 The film centers around farmer Wade Vogel (ARNOLD SCHWARZENEGGER) who, when the film begins, has been on the search for his teenage daughter Maggie (ABIGAIL BRESLIN), who has been wandering the streets of Kansas City when she is picked up by the authorities and sent to the local hospital for observation with a bite mark. With the help of a doctor friend, who assisted the family after the passing of Wade’s wife, and Maggie’s mother, allows her to go home with him with strict instructions to bring her back to quarantine once she turns (in a matter of weeks) and provides him, as well as the audience, what to expect from loss of appetite to eventually wanting human flesh to feast upon. That’s really the basic framework and admittedly, I kind of liked it in all of its simplicity. It’s a different take on the much tired zombie subgenre. However, that’s really where the praise ends for me. 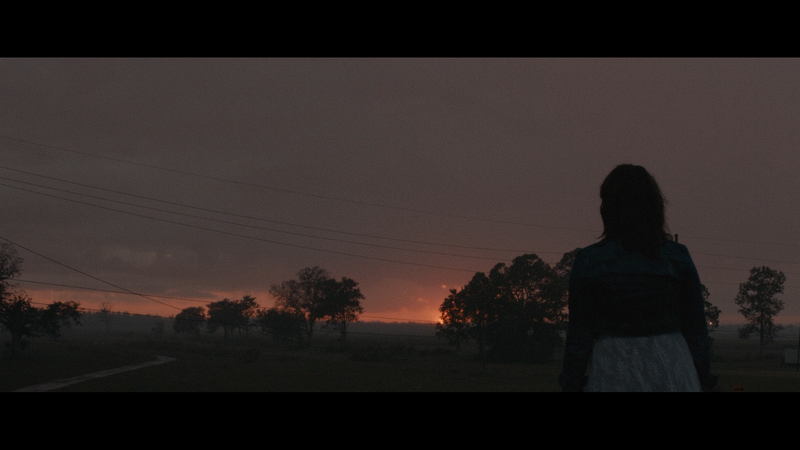 Although the core of Maggie is sound, the rest is frankly a bit dull and doesn’t quite resonate on an emotional level which is necessary for the movie to make a lasting impact. One of the problems I had with the film is with the casting of Schwarzenegger himself. I know he’s received a lot of praise for doing something different, something more dramatic but he’s so distracting in each of his scenes that I had a hard time taking him seriously. His performance, on a technical level, wasn’t bad per se yet… I don’t know, just never quite connects by the film’s end. 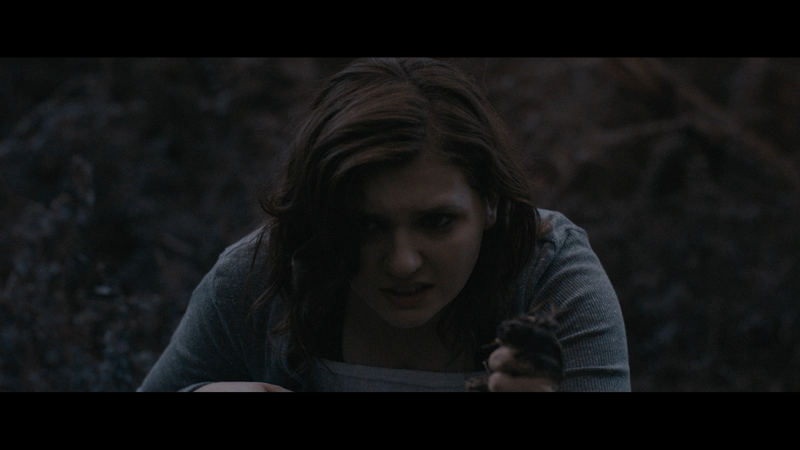 On the plus side, Abigail Breslin turns in a good performance and she does have one scene that does give the film some emotion where upon Maggie goes out with her friends, one, a former flame, also infected, and when her best friend drives her home their final scene together struck an emotional core. A brief emotional core but there was finally some semblance of passion in an otherwise lifeless film. Maggie was directed by Henry Hobson marking his feature directorial debut after many years as a graphics artist working on numerous main and end titles (Snow White and the Huntsman, The Lone Ranger and Sherlock Holmes to name a few). So with that in mind, the choice of Hobson certainly was interesting… The script was by John Scott 3 who also is making his debut. I think perhaps with a more experienced director and a couple more passes on the script, Maggie might’ve made for a well done and memorable zombie drama instead it has some interesting ideas that never quite executes as well as it could have. Audio Commentary – Director Henry Hobson sits down for a low key yet still informative track breaking down certain shots and working with the actors. 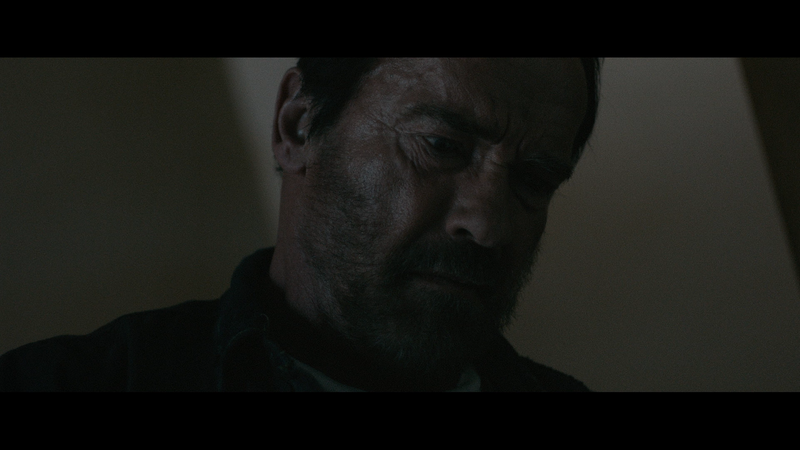 Making Maggie (18:14; HD) is a behind-the-scenes featurette that includes interviews with the cast (including Schwarzenegger and Breslin) and crew (Hobson, et al) as they chat about the characters and story. Interviews with Cast and Crew (TRT 50:07; HD) more or less is an extended footage with Hobson (8:36), Scott 3 (6:34), Schwarzenegger (19:48), Breslin (7:19) and Richardson (8:10). 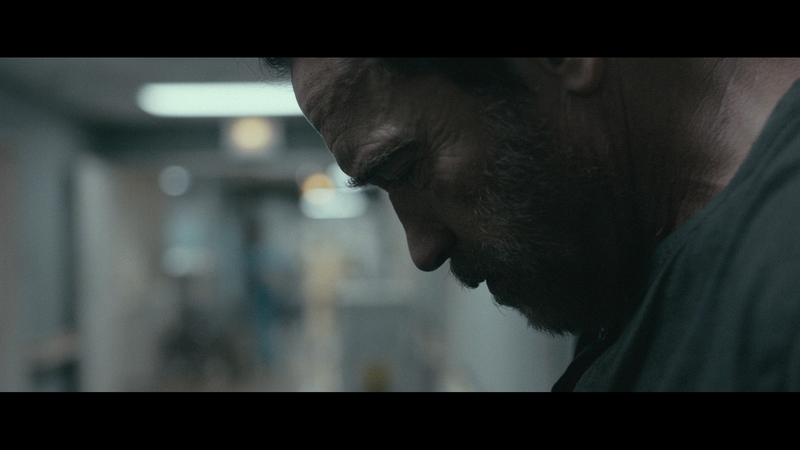 Deleted Scene (2:15; HD) – We get a singular scene that basically expands on the personal anguish with Wade. Lionsgate releases Maggie onto the public presented in its original 2.40 widescreen aspect ratio and shown with a 1080p high-definition transfer. The picture looks great from sharp detail levels to stark blacks for the numerous dark shots/scenes permeating the movie. Colors tend to be more on the muted side but there’s still a decent pop to the transfer. The 5.1 DTS-HD Master Audio track is rather limited. Outside of an early scare scene, the bulk of the film is dialogue driven so the center channel gets used the most with the front and rears especially take on ambient noises or the music. It’s nothing remarkable but still impressive enough all things considered. 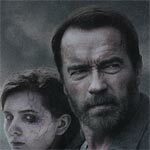 Overall, conceptually Maggie actually isn’t a terrible idea and manages to distinguish itself with the plethora of zombie films that have permeated the cinema marketplace and only grew more popular with “The Walking Dead.” Still, for all the flaws with the screenplay and a WTF casting of Schwarzenegger, this might be worth a rental.